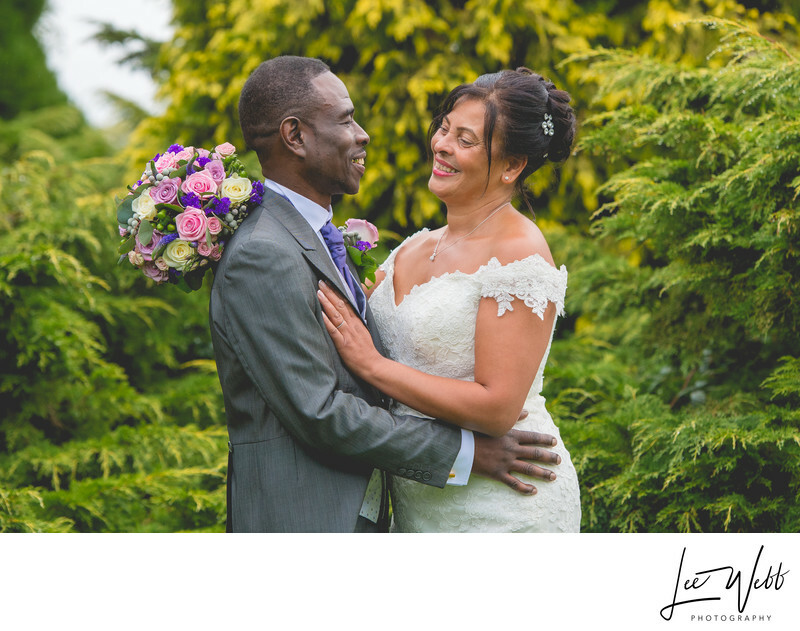 Jacqui and Howard got married at Kings Norton Church before moving on to their wedding reception which took place at Kings Norton Golf Club. The weather forecast had threatened rain all day, and for once the meteorologists had got things spot on. I had spent all morning with Jacqui and the bridesmaids at their hotel, with everyone keeping an eye out of the window to see what the weather was doing. Everyone was quite relieved that when it came time to leave for the church, the weather seemed to be holding off. The church service lasted about an hour. Three quarters of the way through I started to become aware of a tapping noise in the background, but I was quite hopeful that it wasn't rain as outside, through the frosted windows, it still appeared to be bright. When the ceremony finished and the bride and groom made their way back down the aisle, once they reached the end of the church hall the main doors swung open to the outside. What greeted us was a wall of water! As well as that, the wind had really picked up and there was practically no chance of us taking any photos outside. Luckily for us, one of the guests had an enormous fishing umbrella in the car (picture it more like a tent on a pole!) so I was at least able to get a couple of photos of the bride and groom at the Kings Norton Church. When we moved on to the reception venue, the rain was still hammering down. We took the formal group photos inside the large entrance atrium after the drinks reception, where I used my portable lighting system to ensure the wedding photos were still perfect. Suddenly, we got a break in the rain and dashed outside in order that we had at least some photos at the reception. Kings Norton Golf Club has some wonderful hidden gardens if you know where to look. These little secluded beauty spots are the ideal hideaway to capture some portraits of the bride and groom. Using my signature pose, I stood the bride and groom in such a way that you could see all of the important details that made their wedding day unique - the brides flowers, the groom's suit, the wedding dress, buttonhole flowers and wedding/engagement rings. 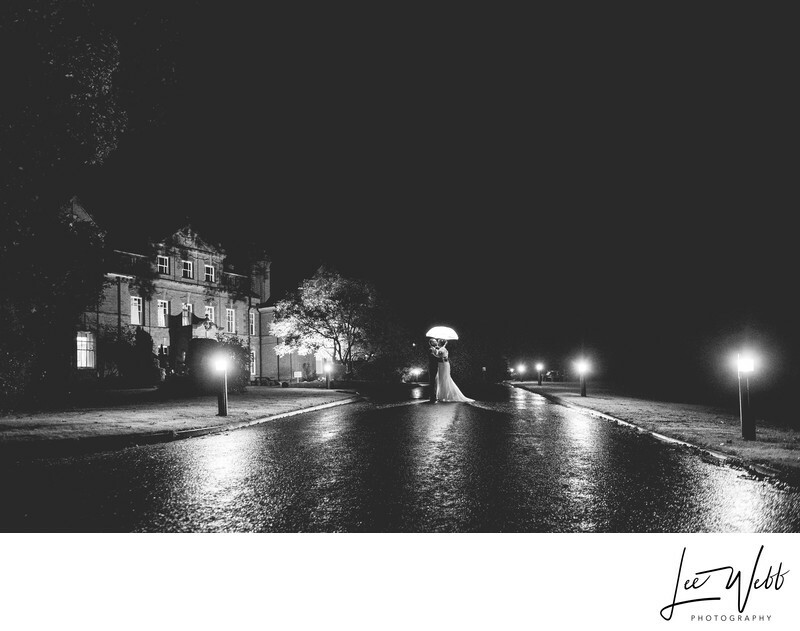 Soon after these photos were taken, the rain started coming down again but we still managed to get some extraordinary photos outside at the venue - have a look at the examples below! 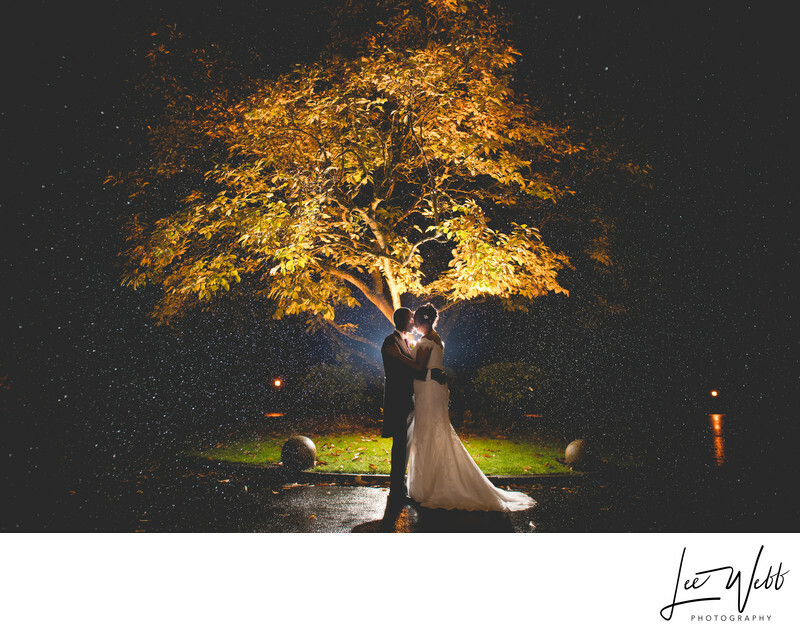 In order to take these photos, I used an off camera flash to highlight the outline of the bride and groom as well as illuminate the rain drops.